The Thalie comes from an artistic activity and not an industrial one. 2: To reach the best sound quality. All choices for the development of the Thalie were guided in order to fulfill these three objectives. Only four rotating mechanical parts: the motor, the pulley, the tray on its axis and the bearing. The reduced number of mechanical parts and the overall simplicity of the whole unit give an excellent reliability. Also in order to ensure maximum reliability, the dragging is done by a synchronous motor. Thanks to it, no electronic speed control is required. On the Thalie this control is completely mechanical and is regulated by the electrical network frequency which is very stable. 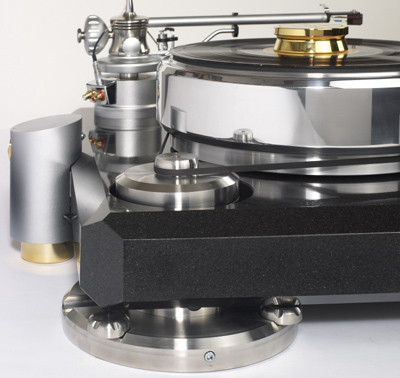 Heavy building with its granite pedestal which weight 50Kg and 20Kg for the platter, both are cut and machined to provide maximum protection against resonances that may interfere the musical restitution. The parts machining is carried out with a tolerance of about a micron, which is the dimension of the grooves of a vinyl record. This extremely meticulous precision allows the Thalie to get all the information deep into the grooves and thus provides perfect sound reproduction. "This masterpiece made turnable reproduces at every instant the musical message, highlighting it. Thanks to its extraordinary analytical and transcription capabilities. 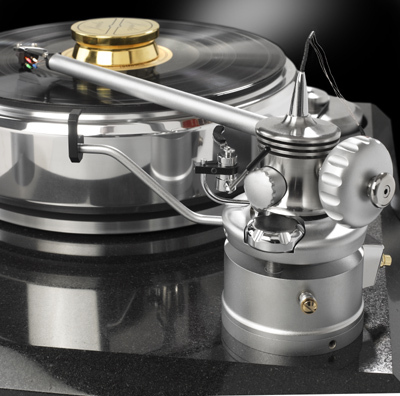 This turntable overcomes all the mechanical constraints of the analog discs in order to preserve the best of the music for the pleasure of the audiophiles. 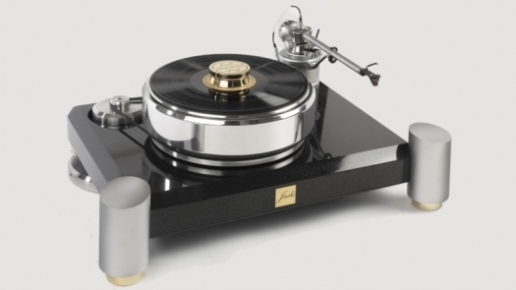 We will never forget the listening that we made with the Thalie."